Towards a cashless society. Mobile Banking has always been known for its convenience, but the new ING Mobile Banking and digital payments 2015 report explores a range of other benefits. The ING International Survey on Mobile Banking, Latest Technologies and Financial Behaviour of the Consumers examines other aspects such as mobile shopping and new payment methods. The survey was conducted on 14,829 people in 15 different countries. Around 185m European consumers with access to mobile devices are expected to use mobile payments apps over the next year, which is an increase of almost 51%. 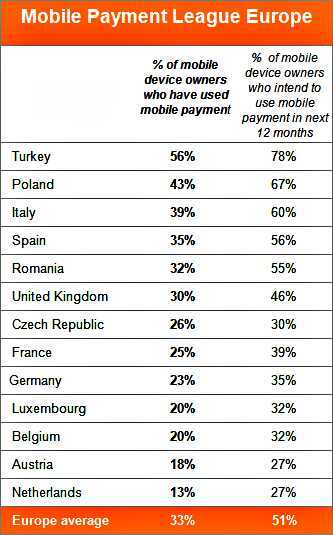 When it comes to the usage of mobile payment apps, Turkish and Polish leads the way with 56% and 43% mobile device owners using one or more mobile payment apps. The adoption rate for USA is 42%. Around 42% of the people yet to embrace mobile payment apps cited trust as the biggest barrier to make the switch. This means that more work is required to gain the trust of the consumers and assuring them that their details are safe. According to the ING International Survey 2015, Netherlands is the most developed mobile banking market, followed by the United States in the second place and the United Kingdom in the third place. Even though the current mobile banking users is less in Europe compared to the United States and Australia, it has the highest share in Europe who are intending to use it in the coming year. Turkey is identified as the future hotspot for mobile banking as it has the highest number of internet users who use mobile banking. About 85% of people using mobile banking in Europe claims that their money management has greatly improved since they started using mobile banking apps. Consumers say that they are in better control of their finances, save more and are paying bills on time since using mobile banking. In countries such as Italy, Romania, Poland and Turkey, 90% and more feel the same way. More than half of mobile banking users in Europe and the United States have shopped online in the last 12 months. Turkey, Poland, Romania and Italy are leading with the highest share of mobile shoppers in the world. Belgium, the Netherlands and France have the lowest mobile shoppers in the survey. Clothing and electronics were the most bought items using the mobile devices. 55% of mobile shoppers in Europe say that they feel more inclined to shop at stores that have ‘save payment’ details for faster ordering. This trend is high in the United States, United Kingdom, Italy and Australia. This trend not only encourages people to spend on impulse, but also reduce their wants to shop for a cheaper deal. To read the full report in details to know how mobile banking has changes our world and the way we shop, click here. 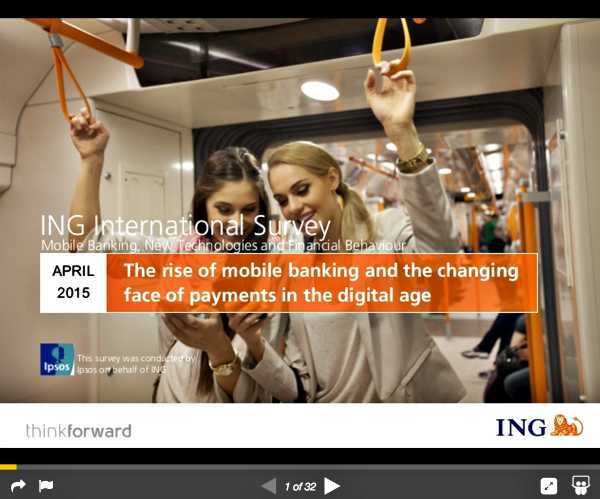 This 2015 report from the ING team on mobile banking and digital payments highlights perfectly well the key challenges and opportunities for well established banks, new players and FinTech companies based on ever changing customer behaviours and the acceleration towards a fully cashless society.